My Favorite Best Home Office Desks for Small Rooms! My Favorite Home Office Desks for Small Rooms! Are you looking for the best home office desks for a small room? However, we need a lot of self-discipline! I strongly believe that having a nice and cute home office desk really helps you stay organized and motivated! That’s why I decided to create this page today. I selected a few of the most practical and compact home office desks to help you keep your working area nice and neat while you create amazing things! I wish you lots of success and creativity! *These are also great for a teenager’s bedroom! *What are the best space saver home office desks? Before you go ahead and buy your new (and hopefully cute!) home office desk, you need to answer a few questions. First of all, there are THOUSANDS of beautiful home office computer desks for sale online, so you need to narrow them down to fit YOUR needs, obviously. Can you afford a 500 dollar desk? I truly recommend investing in a good-quality desk, that will last at least a few years. Believe me, I had my fair share of going with the cheapest options in the past just to be very disappointed a couple of months later. Be sure of how much space you actually have in your room. What kind of working desk do you prefer? 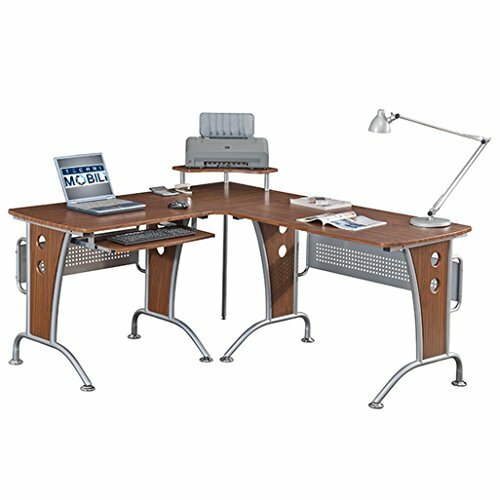 Corner desks, wall desks, stylish and modern, classic looking, wooden or metal? Lots of drawers and storage or just the basics? And last, but not least, what color is best for your room? Black, white, natural wooden, glass-topped and metal? 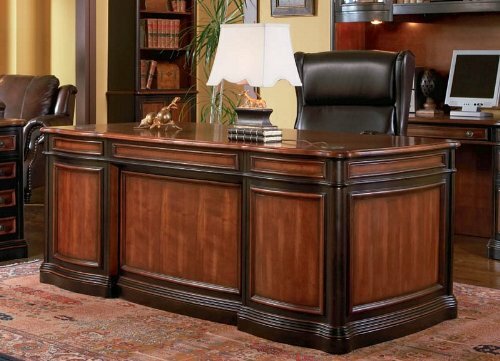 If you are looking for a high-quality and very fancy looking solid and heavy wood executive desk for your home office, then I think you are going to like this one! It looks like the ones you see on soap operas and movies! 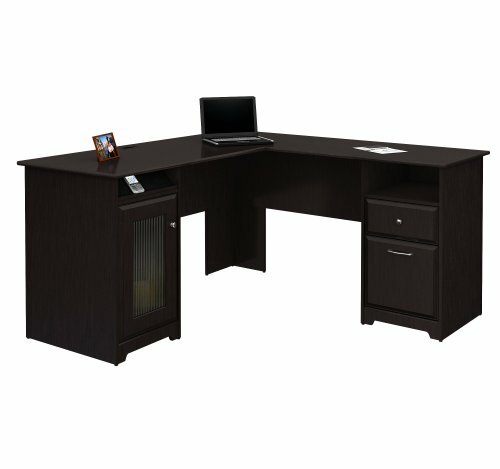 This elegant wooden desk has 7 drawers, a power strip and drop front keyboard as well! 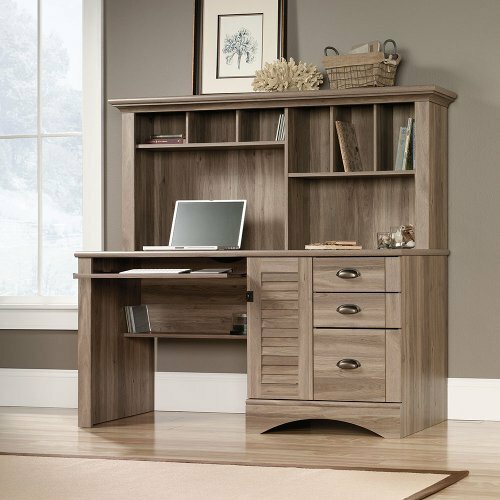 Perfect to create a very elegant home office! This is a solid piece that will probably last for a lifetime. Practical L-shaped Home Office Desk! 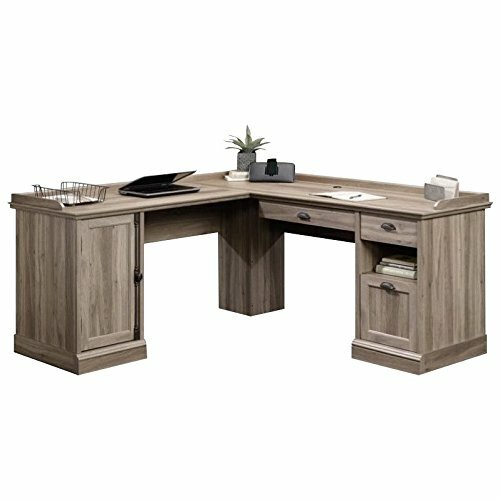 This beautiful L-shape wooden executive desk is one of the most practical home office desks around! It is very spacious and functional, but at the same time will save space in your home, since you can have it in a corner! As you can see you create two separate working spaces for you: one computer side, and one writing side. I love the huge bottom drawers and the beautiful cherry color! It also comes with filing drawers that accept letter, legal or A4-size files. 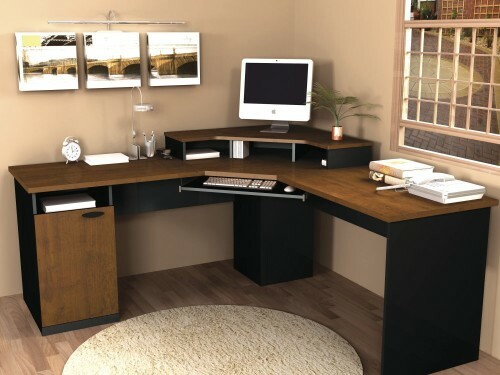 *Cute, Modern and Affordable L-Shaped Desk with Steel Frame! 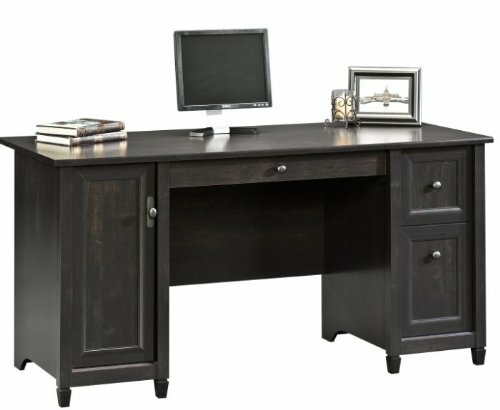 This is a cute, modern and very affordable corner home office computer desk! I love the colors and the overall look! The steel frame and wood combination is fantastic! Look how ‘clean’ and organized it looks in a room! This is also a very compact work desk! It is not too difficult to put together and the instructions are very easy to follow. But the best feature of all is actually the price! Great gift idea for any working from home person in the family or a teenager’s bedroom! Talk about cool and modern looking home office desks! 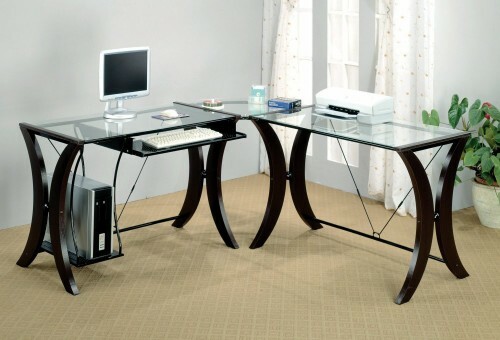 How about this gorgeous, modern and very affordable L-shaped glass computer desk for your home? I love it next to a bright window just like in this picture! The glass top is gorgeous! It’s very compact as well and will definitely fit a small room! The best home office desks need to save you space and be very practical! Another excellent space saver cute wooden home office corner desk for sale! It is also very sturdy, heavy and feels very spacious too, even though it will fit a small room. Great price and it ships for free! Working in a this beautiful home office will be such a pleasure! *How about a Cute White Corner Computer Desk? It has three drawers and one cabinet, it is very sturdy and as you can see it looks amazing after it’s assembled! White desks are also perfect to brighten up your room! *It is proven that people are more productive at work when they have a nice, clean and organized working station! It’s no different when we work from home! Having a tidy working corner will greatly improve your creativity and productivity! What a cute and very affordable L-shape wooden desk for sale! I love this oak finish! Look at that nice storage space underneath too! Looks cute either in the bedroom or home office! It is also very sturdy! If you are looking for the best (and the cutest!) compact home office desk to have in the bedroom, I think you are going to like this beautiful computer desk and hutch in a gorgeous salt oak finish! It will fit everything work/study related, plus your computer! It is also very compact and will fit basically anywhere you want! This cute desk is absolutely perfect for any teenager’s bedroom and will make the room look very nice and organized! *Invest in a nice office chair! This is the place you will be spending most of your time working, so the chair is just as important, if not more important! *Try to place your new home office desk in the brightest corner possible! Trust me, that makes all the difference when working! Natural light is way better for our productivity than artificial light. *Load up on your caffeine!